Proposition 3 looks simple, but it uses Proposition 2 which uses Proposition 1. Prop 3 is in turn used by many other Propositions through the entire work. For debugging it was handy to have a consistent not random pair of given lines, so I made a definite parameter start procedure, selected to look similar to the traditional start points. 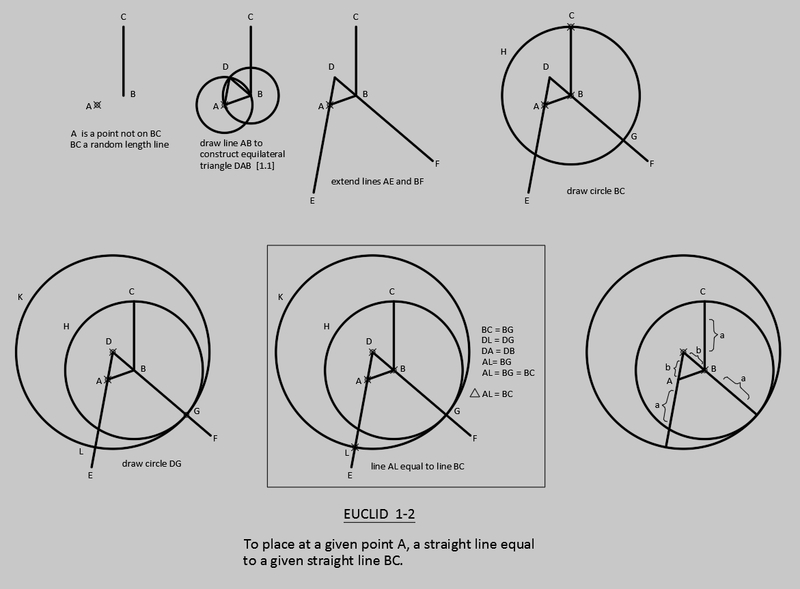 Euclid’s 2nd proposition draws a line at point A equal in length to a line BC. It uses proposition 1 and is used by proposition 3. I tried to make a generic program I could use for both the primary job of illustrating the theorem and for the purpose of being used by subsequent theorems, but it is simpler to separate those into two sub procedures. 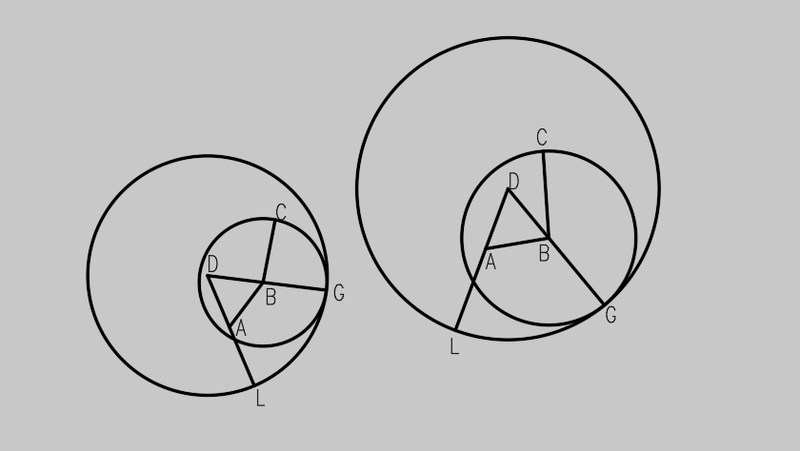 The programming was pretty easy except when a line is extended to meet a circle, there are two intersections, and one of them has to be selected. A good illustration with labeled objects helps keep it straight. In autocad 1-2 is not a problem. The solution would be to copy or move the line endpoint to endpoint. In Euclid, lines cannot be moved. The compass cannot be used to transfer a distance by being picked up off the page. 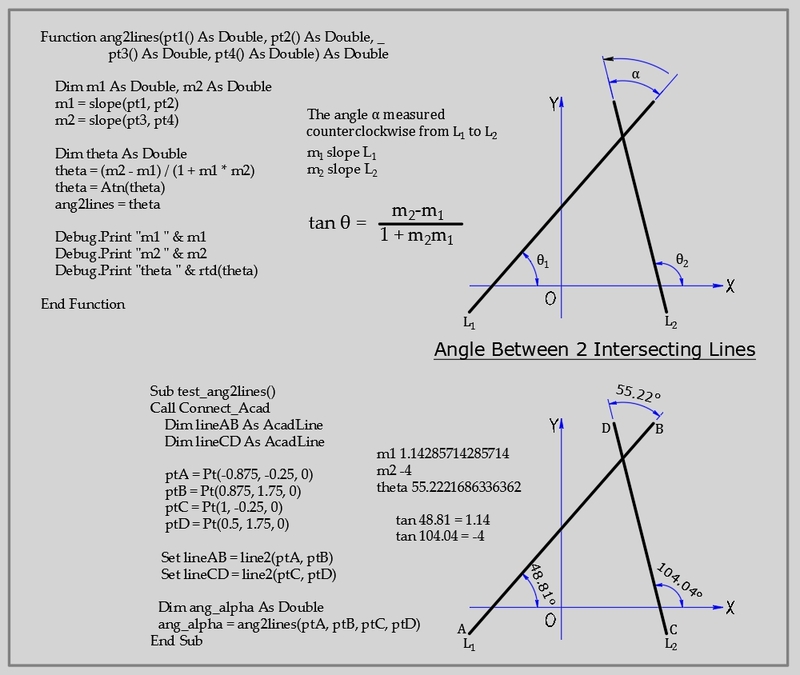 In autocad items are rigid. When two objects the same are copied to the same location they exactly coincide. Euclid’s 4th Axiom is “Things that coincide with one another are equal to one another”. This has caused remarks as to its real meaning. If you cannot move an object to super-impose, how would you know, and even if you could move them, no physical object will perfectly cover another. 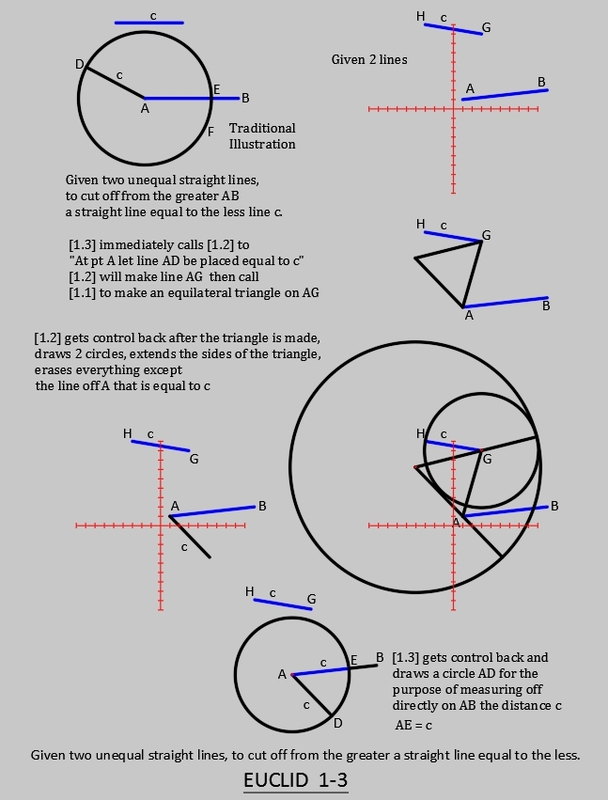 This common belief, things that are the same coincide, is intended to point to ideal form, like we have in a cad program.